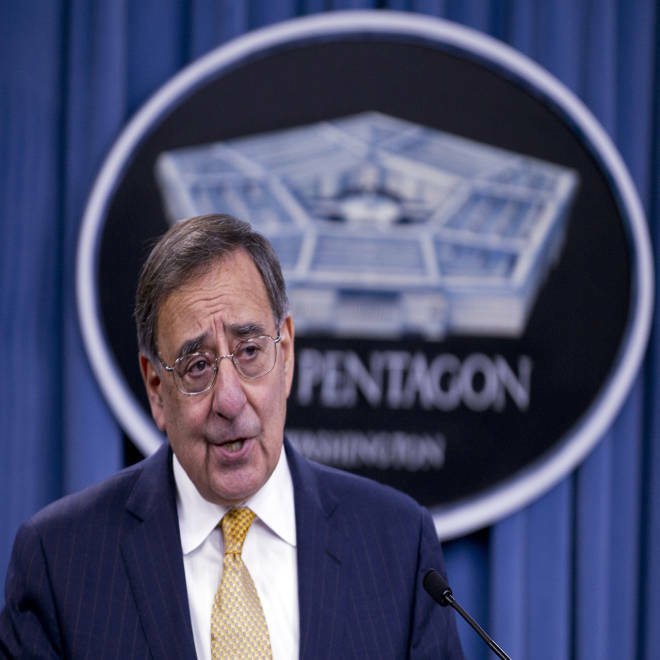 Former Defense Secretary Leon Panetta speaks a news conference at the Pentagon on Nov. 29, 2012. The new allegations, first reported by NBC News, are contained in an amended lawsuit filed in U.S. District Court in Washington, D.C., by Jill Kelley and her physician husband ,Scott. Among other things, the lawsuit charges that the Kellys’ names, emails and personal information were improperly leaked to the media by government officials in the days after Petraeus resigned on Nov. 9, 2012. The Kelleys inadvertently triggered the investigation that led to Petraeus’ departure in the spring of 2012 when they reported to the FBI that they had received harassing and threatening emails from an anonymous cyber-stalker. The harassing emails were later traced to Petraeus’ biographer, Paula Broadwell, with whom he acknowledged having a sexual affair. In the aftermath of Petraeus’ resignation, Jill Kelley came under media scrutiny because of her close social ties to top U.S. military and intelligence officials, many of whom she had met at parties thrown at her home near MacDill Air Force Base, the headquarters of the U.S. Central Command. Her revised lawsuit—with new allegations and named defendants—updates a complaint that she and her husband first filed in federal court in June. The Justice Department, which is representing all the defendants in the case, recently moved to dismiss the earlier complaint on the grounds that the Kelleys lacked standing to sue and sufficient evidence of wrongful acts – arguing that any information disclosed was not covered by the federal Privacy Act. A spokeswoman for the Justice Department declined comment Friday on the revised complaint. Jill Kelley leaves her home in Tampa, Fla., on Nov 13, 2012. The amended complaint is in part designed to ramp up pressure on the Justice Department to engage in settlement talks by making new claims and naming high-profile defendants and witnesses who would likely be subpoenaed if the case proceeds, according to sources familiar with Kelley’s legal strategy. Among other things, the lawsuit alleges that Deputy FBI Director Sean Joyce, who is due to retire next month, then-FBI director Robert Mueller, Attorney General Eric Holder and other top Obama administration officials made decisions about the Petraeus investigation “based on the timing of the (2012) presidential election.” As NBC News reported earlier this month, that allegation is based largely on the account of a Florida-based FBI agent, a friend of Jill Kelly’s who she first told about the harassing emails. 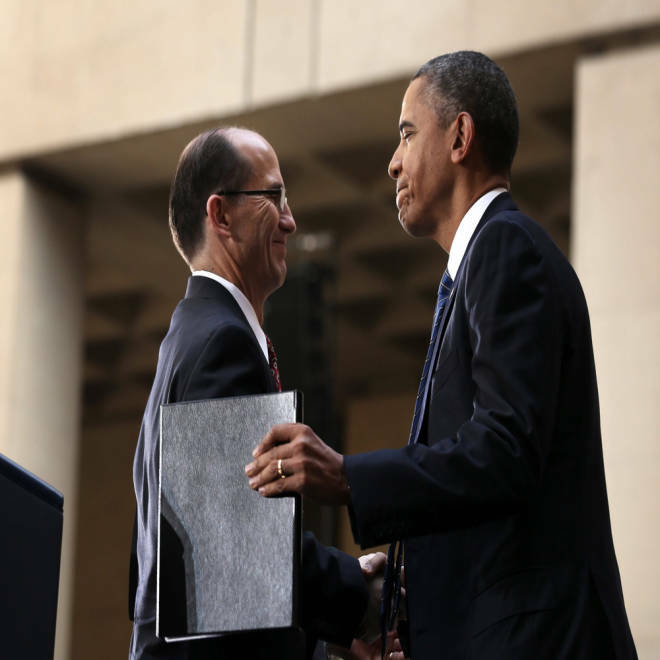 Deputy FBI Director Sean Joyce shakes hands with President Barack Obama during a swearing-in ceremony for FBI Director James Comey on Oct. 28. The lawsuit also cites statements that Jeh Johnson, then the general counsel of the Defense Department and now President Obama’s nominee to be homeland security secretary, made in an interview with the Tampa Tribune in July. In the interview, Johnson said that his review of several years of Jill Kelly’s emails provided to him by the FBI showed a “potentially inappropriate relationship” with Army Gen. John Allen, the former U.S. commander in Afghanistan. Panetta declined to comment on the lawsuit. Johnson did not respond to a request for comment. Frantz, who serves as Secretary of State John Kerry’s chief of public affairs, also declined comment. “The fax speaks for itself,” he said in an email. Kelley’s name first became public last November when it was revealed that her complaints to the FBI in June of 2012 about the anonymous harassing emails she and her husband received had triggered the investigation that led to Petraeus’ resignation. According to the revised complaint, the emails began in the spring of 2012 and made references to private social meetings Kelley was having with senior military and public officials. Kelley reported the emails to a friend of hers, Fred Humphries, an agent in the bureau’s Tampa office, and the FBI launched a “cyber-stalking” investigation.